I've been working on a WPF app that does lots of stuff with XPS (you don't say Josh! Merging XPS Documents, Cracking an XPS in WPF). One thing I wanted to do was have an integrated search that could whizz through my repository of documents and have the results right there in my application. Regrettably, the implementation of this search is somewhat, err, encapsulated. You can only get at it using lots of nasty reflection and 'going unsupported'. I really didn't fancy that. And so my attention was drawn to Windows Search. Built on the original Windows Desktop Search that you added to Windows XP, Windows Search is part of Vista (and Windows 7 builds on this even more) - fortunately, it has an API that we can all use. Oh yeah baby - it's just like SQL! In this case I want to select the display path and the full url for the top 5 files in the system index where the extension is .config. There is a mindblowing number of columns available when querying Windows Search - most of them are only applicable to certain file types, for example: System.Photo.Aperture, System.Photo.ApertureDenominator, System.Photo.ApertureNumerator, System.Audio.SampleRate. You can get the full, daunting, list on MSDN: System Shell Properties, All Shell Properties (use the tree on the left to navigate to the categories). Still, you can put together some amazing queries depending on your application (photo app anyone?). You can do most of the things you'd expect with the WHERE clause: e.g. Very cool - but I needed to search documents and dive into the guts of the text. There are two key ways of doing this: CONTAINS and FREETEXT. This was fine when the query was "powershell" or "windows" but any non-word character blew it up (including spaces). So "where are you? ", "windows vista" and "windows!" were all invalid. Truly awesome so far - but I wanted to limit my search to a specific directory with documents that pertain only to this application. No problem! DIRECTORY - when you want to limit the search to single directory. SCOPE - when you want to limit your search to specific folder and its sub-folders. 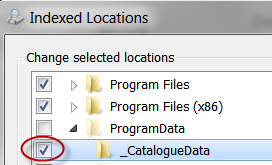 UPDATE - read this post 'Windows Search and the file scheme' before copying this code! There's lots more available in Windows Search SQL - you can ORDER BY and even weight individual columns differently with the RANK BY statement. The final obstacle for your application of Windows Search might be getting the files you want into the index. Sadly, there's no support for INSERT, UPDATE or DELETE in Windows Search SQL but there is a different API to allow you to play with the indexes. As a managed developer, I opted to use the Microsoft.Search.Interop.dll that some helpful folks created as part of the Microsoft Windows Search 3.x SDK. It's pretty easy to use but the documentation is a little sparse. Here's some code I used to add a folder path as a user scoped rule (there are default scope rules that include or exclude folders, and user scoped rules that override these where necessary). As you can see, most of the work takes place against the ISearchCrawlScopeManager interface - and as it notes in the documentation Using the Crawl Scope Manager, you'll need the right permissions to modify the index. I did have some problems with managing query scopes. Specifically, because these files were generated by my application I wanted to keep them tucked away. They're not sensitive or corruptible in any real way, but I didn't want them getting in the users way. 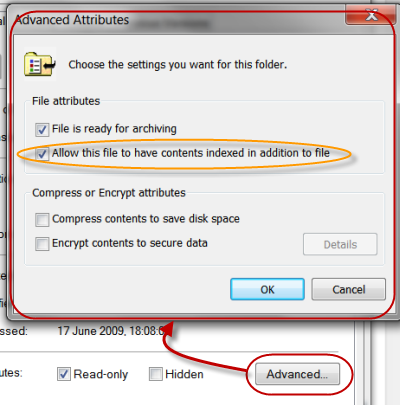 Good places for such files are Common Application Data folders (ProgramData) or User Application Data folders (AppData\Local and AppData\Roaming etc). As you'll see in What is Included in the Index - these folders are specifically excluded. I thought I'd give it a shot at overriding this with a User Scoped Rule for my particular sub-folder. And, although the index made all the right noises (including the UI in Windows 7, below) the contents of these folders simply never showed up in my results. It turns out this is a bugette due to the fact that the exclusion of the ProgramData folder contains a trailing asterisk (c:\ProgramData\*). The solution for me was to put the contents elsewhere, but I believe removing the naughty rule and re-applying it without the trailing asterisk would work equally well. Nice info. But, I tried this and the search did not return pdf files that are present. Also, adobe ifilter is installed and pdf type are indexed. Why? Hello, how i can use Windows Search for files stored in Microsoft SQL server? Thanks for the valuable information. I'd like to know if this would work on windows server 2003 and XP? You'll need to install Windows Desktop Search. I don't think it's as good as Vista's but the details are documented on MSDN somewhere. WRT Search in SQL, I think you'd need to write an extension - I've never tried that. Is WS infrastructure part of Windows Server 2003? I couldn't figure out whether yes or no. I have created a test document with some content. If I search after the word "baloon" I get a hit because it's a standalone word in the content. If I search for example "baloo", I didn't find anything. How do I build a querystring to act like a sql-query "SELECT * FROM table WHERE text LIKE 'ballo%'" to find a document. Thanks, this was useful. I found it strange that find information on this topic on web or in official docs is not so easy. Thanks a lot, this is a very useful post! I do have a question, however, and I was wondering if any of you came across this issue: how to search for those files that are not hidden? I know I have to check the System.FileAttributes property, but I haven't found out just how yet. How do you remove noise from the search, is there is standard rountine or config? I think you'd have to add this yourself, filtering the results before you present them. Not other than the SQLCLR? Sounds kind of ugly though. I have built this onto an ASP.Net page. But as soon as I run it from my production server, querying a remote server, I get an "Access Denied" error. Any idea what rights I must grant to gain access. I'm trying to use Windows Search to return search results from within various websites running on asp.net, IIS7+ on a Windows 2008 server. I've tried many available properties and cannot find one that results in a URL/virtual path to the document. So I can use that in the results for users to click on and go straight to the file. Any thoughts? Thanks!